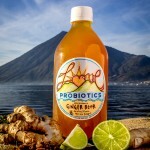 Love Probiotics’ Ginger Beer is a traditionally home-brewed, non-alcoholic, carbonated beverage. Flavored with fresh ginger root and lime juice, this probiotic tonic is particularly helpful with settling upset stomachs, fighting nausea, and relieving diarrhea. Ginger beer is also very high in B-vitamins, and is excellent at boosting energy levels and improving moods. Ginger beer is a live, unpasteurized product. Please open slowly as natural carbonation builds in the bottle. Consume promptly after purchase or refrigerate.